You may have wondered if there was any way to remind the people that you randomly pass by while walking in the mall of the first time they ever visited a sushi resturant. You wish that you can remind them of the subtle smell of vinegar in the air, the pungent yet inviting smell of fake wasabi, or the sweet smell of sake warmed to the perfect temperature. 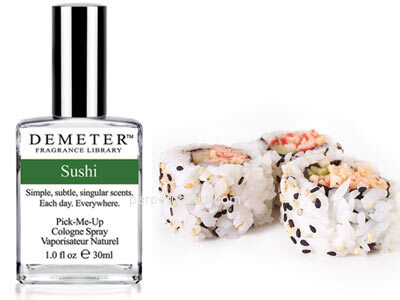 Our sushi scent smells of sticky white rice and seaweed, with a hint of ginger and lemon. Delectable! After all, if it smelled like fish, would you wear it? Demeter creates scents that are drawn from memories to transport a person back to a special place or time. Everyone has a personal library of meaningful smells. The memories they trigger are somehow more intense than those we dredge up by conscious effort. It’s as if smell provides a shortcut to our deepest memories and brings them back complete with the emotions and sensations we felt at the time. Get yours from Perpetual Kid for $19.99. Something you’ve always wanted. Yes. I’m serious. Soy Sauce Ice Cream Topping? Are you prepared for the revolution?